That's how simple it is, really. Re-appropriation. When applied to the visual arts, appropriation connotes the re-use of some pre-existing idea, material or object – we all do this, of course, as art is created in response and relation to the world we live in. To repeat this purposefully, to do this again in the form of re-appropriation is a method of practice. So, where are we in this discussion as it relates to photo-based practices? How do we navigate the ever-expanding sea of orphaned images within our midst, as well as time honored genres, themes and subject matter? Can an image or idea really belong solely to one artist or author? Is appropriation even the most fitting term at this point? Is this still what artists think they are doing when they quote or borrow from one another or from the culture at large (see Tom Griggs essay on originality HERE), or choose to incorporate pre-existing images into secondary works in the same manner as the re-purposing of found objects? Of course, we know the latter example was deemed appropriation in the era of Duchamp's readymades, but again, is something different in play or at stake when we confine the discussion to photographic materials? And ultimately, why do so many discussions around appropriation devolve into embattled debates focusing on property and ownership rather than purpose and intent? There are many recent and historic examples that could be cited as a means of addressing these questions, but I'd like to start with an image that prompted an interesting discussion when it was displayed as part of a public art project in the window of a downtown storefront in Asheville, North Carolina. 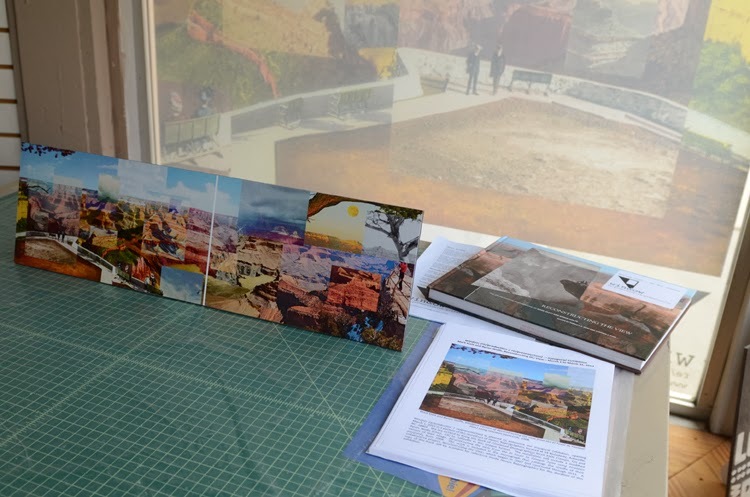 The image is titled Reconstructing the view from the El Tovar to Yavapai Point using nineteen postcards and constitutes one of the mashup works from Mark Klett and Byron Wolfe's Reconstructing the View project. It might be useful to begin by simply questioning how this work corresponds to the ideas mentioned above in relation to found photographs, and then, to think about why the artists made the choices they did in terms of subject matter, mode of representation, and manipulation of materials. When this print was displayed as the inaugural work at Window (Re/production | Re/presentation) a few things seemed to really preoccupy viewers. First and foremost was the re-appropriation of antique postcards, which also relates to issues of authorship and originality. For some, there was a sense that the now anonymous photographers of the original postcard images should in some way be credited. This type of response is often provoked and exacerbated when viewers illogically link their reactions to their own actual or (worse) hypothetical practice – be it artistic, commercial or both - instead of considering the particulars around the piece under consideration. While there are certainly instances of unethical lifting of artistic/intellectual property for commercial gain, it's pretty clear that the work of Klett and Wolfe is not intended to serve as a commodity in the same manner as the postcards (created and distributed decades earlier). The hope was that installing the work in this manner would lead to a thoughtful consideration of the site-specific and temporary nature of the modified version of the work, prompting one to consider its purpose more carefully, and perhaps resulting in a reassessment of preconceived views. Of course, there were also mixed responses to the nature of the image itself. Because the primary image is a composite/montage created by grouping and relating numerous secondary images together, this makes the image somewhat distinct from a more straightforward photographic representation that describes one moment, from one vantage point. Questions arose as to whether it could or should be considered a "true" photograph, largely stemming from the fragmentary nature of the view, which challenges traditional notions of the scenic or picturesque. The particular aesthetic qualities of the vintage postcards also prompted some to have trouble reconciling the retro/nostalgic associations that are sometimes attached to this kind of imagery with the conceptual concerns of the artists. 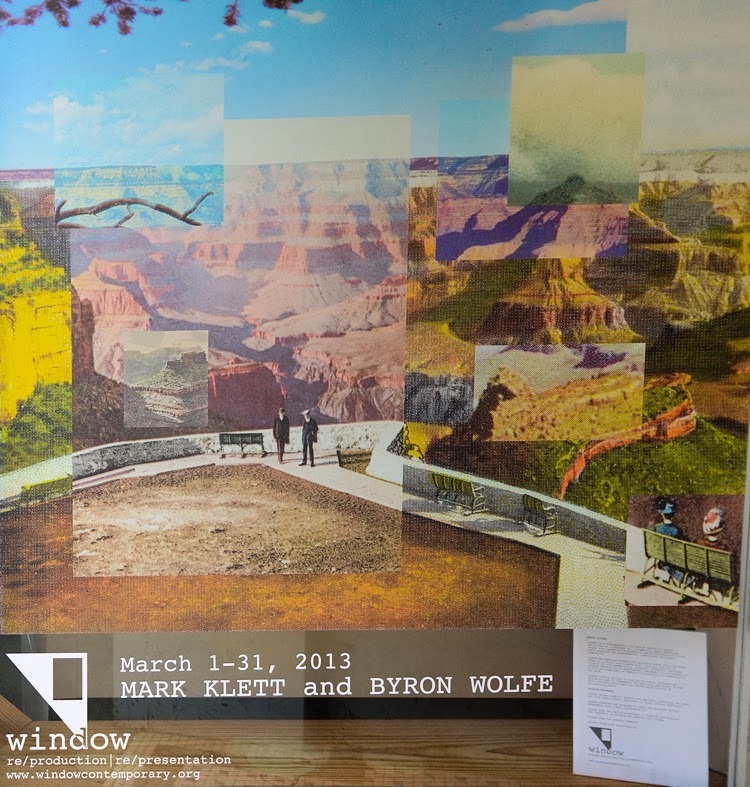 There can be a sort of immediate response to work that repurposes the types of images that are used within the modified Klett and Wolfe montage that was displayed at Window, especially for those unfamiliar with the pair's prior and/or related work. A quick and cursory view of this work may yield a very different interpretation than a more prolonged engagement, especially given that the piece is entirely decontextualized from the pair's larger body of work (examples of which were on view inside the shop that hosts the project in the form of the monograph, Reconstructing the View), and is also an excerpt from a much larger piece containing a panoramic view. Indeed, the first associations that come forth might lead one to quickly assume the purpose of the image (and of its construction) is simply to playfully juxtapose colorful "retro" style images to re-create a beautiful landscape. These aesthetic qualities surely play a role in the construction of meaning, but only when the process of questioning begins can the viewer see underneath this surface and begin to engage with a secondary set of concerns. Now, admittedly, we're often not privy to the artist's intentions and their rationale for employing particular methodologies when we encounter their work. Yet in this instance we're given a wonderful insider's view through the monograph's inclusion of exhibition curator Rebecca Senf's essay that thoughtfully picks apart both the process and content of the work (and the direct relationship between the two) and also incorporates comments from the artists themselves which helps us get beyond the initial impressions a cursory and quick view might leave us with. Below I've included a few excerpts from Senf's essay that I think may help illuminate the work more broadly, and perhaps provide a richer understanding of the impetus behind Klett and Wolfe's project, and its value as a contributor to larger conversations around the repurposing of mechanically produced images. A key component of Klett and Wolfe’s rephotographic framework is its subversive intent: rather than reflecting a nostalgic interest, the historic images allowed the artists to question assumptions about the past, and, in so doing, to challenge generally held perceptions about the present and the future. The challenge that Klett evokes points directly to contemporary concerns around the very nature of photography – both the creation and dissemination of images. Encouraging a more excited response could serve us all well in what has in many ways become a climate of distrust and dismissal. Perhaps one issue around the use and re-use of pre-existing photographs is that many of us are conditioned to react against our visual expectations rather than in relation to them. Encountering images divorced from their initial contexts often leads to discomfort or unease due to the uncertainty that surrounds both their original and transformed purpose. The works of Klett and Wolfe purposefully emphasizes this disconnect through deliberate representational strategies, as Rebecca Senf expands upon in the section that follows. The 'El Tovar and Yavapai Point Postcard Mashup,' (2008), features a range of postcards, made at different times and printed in various media, that are brought together and enlarged to call attention to their method of reproduction. The work combines nineteen postcards, or portions thereof, to create a completely new collage of the view stretching from El Tovar Hotel to Yavapai Point, on the canyon's South Rim…In most cases, the photographers decided to print works that incorporate postcards at roughly their original size, to preserve the feeling of the postcard as a familiar physical object…With the El Tovar and Yavapai Point postcard mashup, however, a large scale was imperative, for the work is about the postcard's visual syntax, its language of representation. Wolfe pointed out the kitschy draw of the exaggerated, amplified colors typical of postcards created in the first half of the twentieth century. (He clarified that he does not use the term "kitschy" to denigrate the postcards but rather to describe their lasting and powerful appeal as collectible objects). Enlarging the final work renders visible the various dot patterns of the original postcards' reproductive processes, and the extreme palettes of maroon, bright orange, icy blue, and lemon yellow compete for dominance. It seems useful to continue examining where our ideas come from in relation to this type of purposeful appropriation of pre-existing imagery, as it relates to our own practice or how we value or devalue the practice of others. Do we stubbornly hold onto strong opinions without questioning their validity or relevance in our current climate? And what about the specific use of vernacular postcards in the Klett and Wolfe work? Is there a hierarchy at play within our minds that suggests a fabricated view is less significant than the depiction of a singular, straightforward representation? We all play a role in determining the cultural value of works of art. But to do so, we must allow ourselves to thoughtfully engage in a process of questioning – of our own instinctive responses to art, our prior conceptions – and to continually re-assess our points of view. This little essay was conceived to ponder these questions, and doesn't attempt to answer them with any authority or certainty. I plan to revisit this topic in a subsequent post by discussing the strangely contentious category of creativity in relation to authenticity and originality by looking to web-sourced works like Penelope Umbrico's Sunsets and For Sale/TVs from Craigslist, Joachim Schmid's Other People's Photographs, Doug Rickard's A New American Picture, among others. 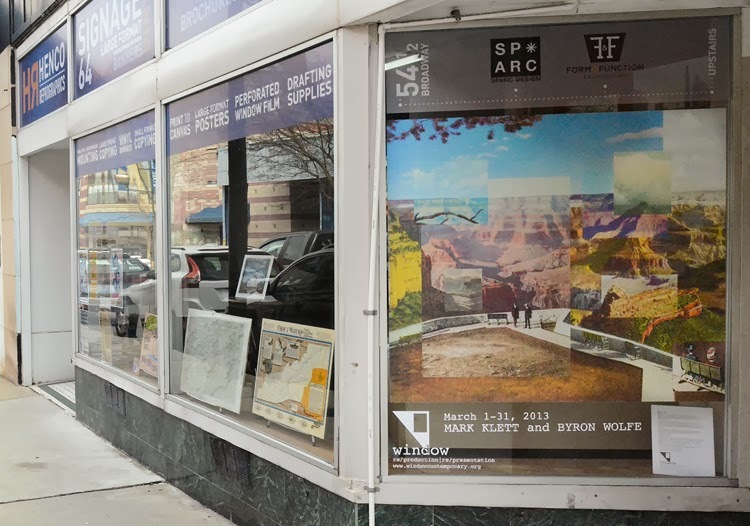 I would like to acknowledge my thanks to Mark Klett and Byron Wolfe for allowing a modified version of their work to be exhibited in this manner at Window (Re/production | Re/presentation). 1 Senf, Rebecca. "Reconstructing the View: An Illustrated Guide to Process and Method. "Reconstructing the View, The Grand Canyon Photographs of Mark Klett and Byron Wolfe. University of California Press, 2012. Print. Dawn Roe (MFA, Illinois State University, BFA, Marylhurst University) serves as Assistant Professor of Art at Rollins College in Winter Park, Florida. Her work is exhibited regularly throughout the U.S. and internationally. Her imagery and writing has been included in many print and on-line journals. Roe recently founded the public art project Window (re/production | re/presentation) in Asheville, NC and serves as the curator.